It doesn't look appetizing, but it's definitely chicken. 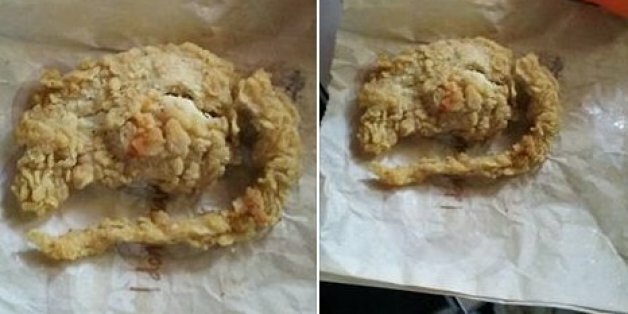 Last week, KFC was forced to confront a customer's accusations that he'd been served a fried rat in a three-piece meal at a Los Angeles store. An independent lab test confirmed that the breaded lump is in fact chicken, KFC spokesman Rodrigo Coronel said in an email to The Huffington Post on Monday. Devorise Dixon, 25, posted a photo of a nasty-looking entree to Facebook after he bit into it and something didn't seem right. He said the piece of food had a rubbery texture, and that a store manager told him it was a rat. KFC was quick to counter Dixon's claims. The company said he hadn't responded to requests to have the meal tested by a lab and wasn't cooperating with an investigation. KFC also said that a photo from Dixon's Instagram feed, which shows the morsel from a different angle, made it clear that the food was chicken (not rodent). KFC now says it's got the science to back up its counterclaim. Coronel said that Dixon's attorney obtained the specimen and turned it over for testing at an independent lab. Those tests confirmed that the chicken tender was made of chicken. Coronel also alleged that Dixon lied about being told the piece of chicken was a rat. "We did an internal investigation and talked to all employees. That statement is false," Coronel wrote. "The right thing for this customer to do is to apologize and cease making false claims about the KFC brand." Coronel said the company is "reviewing all options" when it comes to any potential legal action against Dixon.